According to our faith traditions, killing innocents in the name of God is a desecration of his Holy Name, and defames religion in the world. 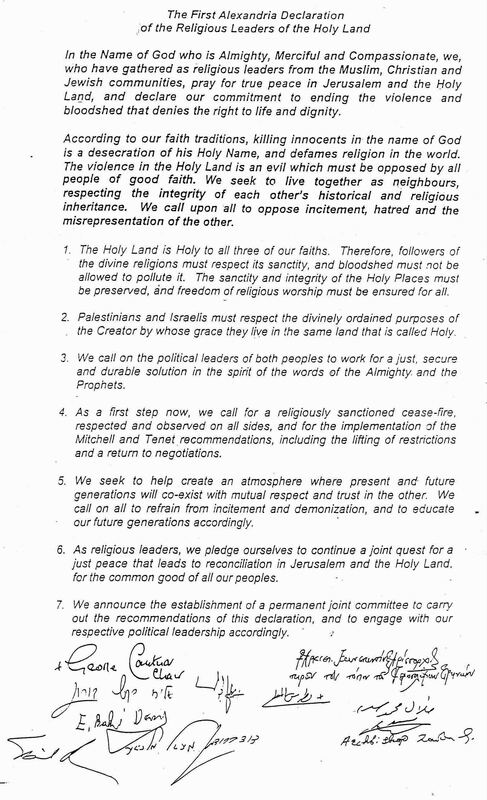 The violence in the Holy Land is an evil which must be opposed by all people of good faith. We seek to live together as neighbors, respecting the integrity of each other's historical and religious inheritance. We call upon all to oppose incitement, hatred and the misrepresentation of the other. The Holy Land is Holy to all three of our faiths. Therefore, followers of the divine religions must respect its sanctity, and bloodshed must not be allowed to pollute it. 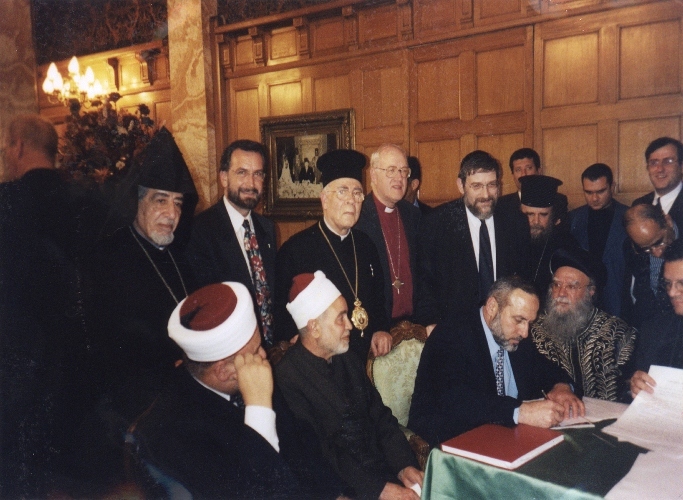 The sanctity and integrity of the Holy Places must be preserved, and freedom of religious worship must be ensured for all.Palestinians and Israelis must respect the divinely ordained purposes of the Creator by whose grace they live in the same land that is called Holy.We call on the political leaders of both parties to work for a just, secure and durable solution in the spirit of the words of the Almighty and the Prophets.As a first step now, we call for a religiously sanctioned cease-fire, respected and observed on all sides, and for the implementation of the Mitchell and Tenet recommendations, including the lifting of restrictions and a return to negotiations.We seek to help create an atmosphere where present and future generations will co-exist with mutual respect and trust in the other. 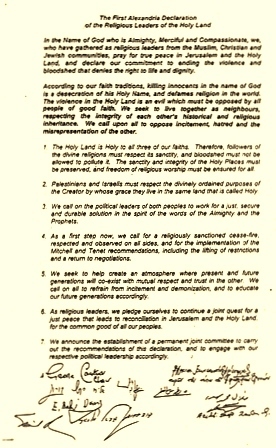 We call on all to refrain from incitement and demonization, and to educate our future generations accordingly.As religious leaders, we pledge ourselves to continue a joint quest for a just peace that leads to reconciliation in Jerusalem and the Holy Land, for the common good of all our peoples.We announce the establishment of a permanent joint committee to carry out the recommendations of this declaration, and to engage with our respective political leadership accordingly.